Now you can brainstorm anything while texting. Spouses can brainstorm ideas for family trips and activities. Friends can brainstorm dinner or weekend plans. Work teams can brainstorm new product ideas, feature lists, advertising ideas, product names, brand strategies, event ideas, marketing concepts, and a thousand more things. Wicked Brainstorm is as wicked as your imagination, and it all happens within Messages. What makes Wicked Brainstorm the easiest and best way to brainstorm with friends is that you can do it anytime and from anywhere. Y'all don't need to be in the same room; you don't need to be working at the same time; there's no stress of creating great ideas in front of your coworkers; you don't need a special account or to supply a name & password. Simply add your ideas to the list whenever and wherever you are, and the people you're messaging will see them live and can add their own ideas with the same freedom. Did we mention it's free? We forgot? Oops. It's absolutely FREE plus comes with 50 free stickers for which you can also change the font and color. Tap Start new topic to brainstorm with the people you're messaging. Wicked Brainstorm shows all the free built-in stickers plus the ones you create in Wicked Custom Stickers™ in a scrollable list. Press a sticker and drag it onto a message to send it to that person or group. You can change the font and color of your stickers, too. Brainstorming works best if you have a clearly worded topic. After you've started an iMessage to a person or group, and tapped the Start new topic button, just type a good topic and tap the Send message button. Confirm sending it to the group, and y'all are ready to go. Once a topic has been started, anyone in the group can add ideas. 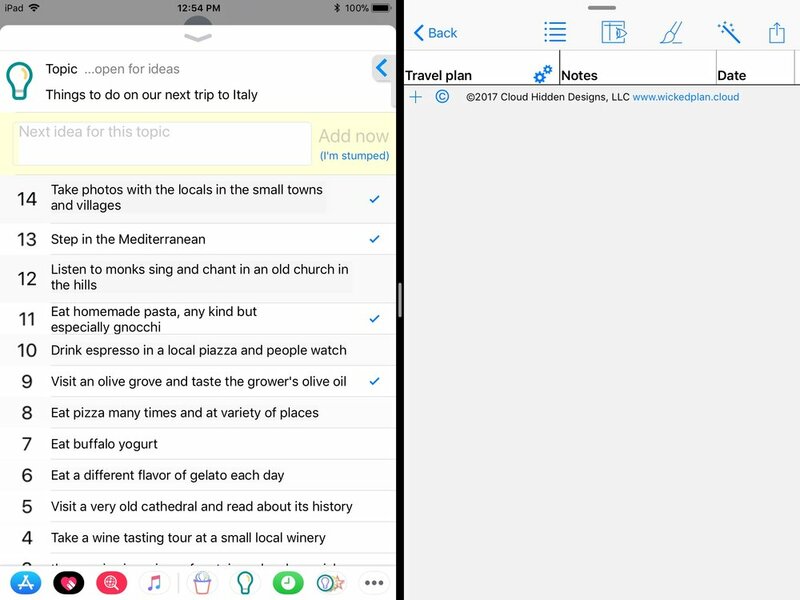 Type an idea, tap Add now, type another idea, tap Add now, and so on. Whenever you wish to send all of this to the group, tap the Send message button. On iOS 10, confirm sending it, while on iOS 11, the message is sent directly. Ideas are added to the list in the order sent. Names are not attached, so no one dominates the action. Tap the slide-out tool bar to work with the list. If you pause the list, you can delete and rearrange ideas. 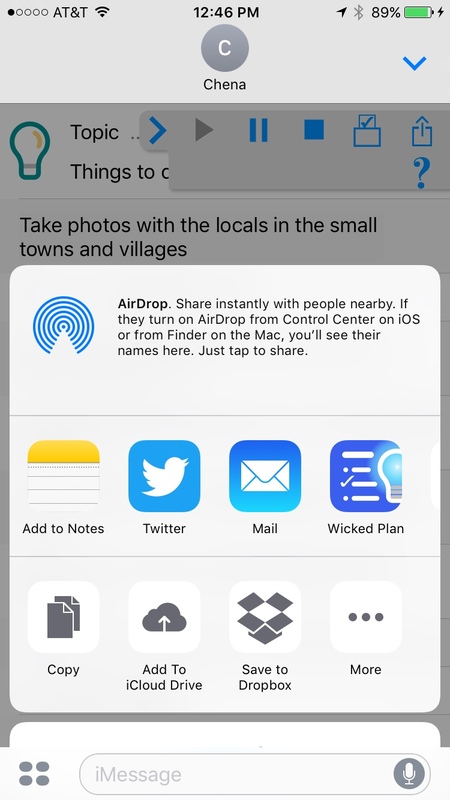 If you stop the list, you can share it with Wicked Plan™ and other apps. And you can switch from adding ideas to making it a checklist to voting for favorites with a simple tap. There is a time to stop adding ideas and decide which ones are best. Wicked Brainstorm provides a checklist for simple prioritizing and voting for more formal decision making. Voting comes in two flavors: one vote per person and more than one vote per person. Use the one that makes sense for the group. An example of allowing more than one vote per person is a group brainstorming new product features. If there are 25 suggestions, it'll make more sense for people to vote once for every feature they think is legit than to only be allowed to vote for their single favorite feature. With either method of voting, each person gets to submit their votes just once. Your brainstormed list can be shared with other apps! Most powerful of all is how it's shared with Wicked Plan™. 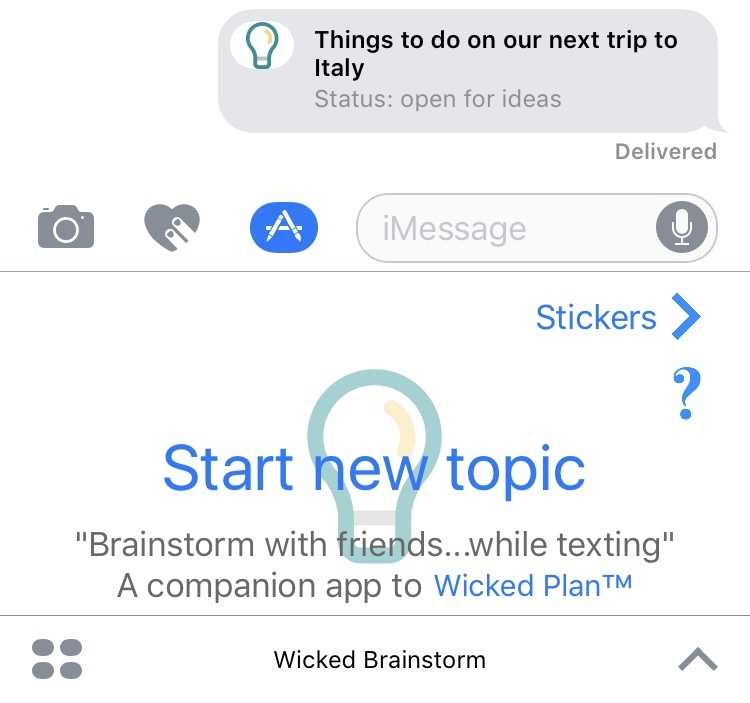 When you tap Wicked Plan from the Share window, Wicked Brainstorm will post the list directly to your open Wicked Plan document or automatically import it the next time you launch Wicked Plan. It feels like magic. Even the checkmarks and vote totals are included, and then you can work more with the list there by adding timelines and all else that Wicked Plan provides. This series of screen shots shows Wicked Brainstorm and Wicked Plan in split screen on an iPad. Ya gotta try it...it's so wicked! In iOS 11, ideas can also be shared by dragging them to another app, which is incredibly cool and convenient.